December 27, 2013. The second leg of our Jamaica trip took us to beautiful Montego Bay, a coastal city upcountry from Kingston. We were greeted by Robbie, a local restaurant owner with ties to the Real Madrid Foundation, our local organizing partner here in Mo Bay. The Real Madrid Foundation is a new and growing organization in Mo Bay that is affiliated with the now-familiar Spanish-Jamaican Foundation and Ballaz International. 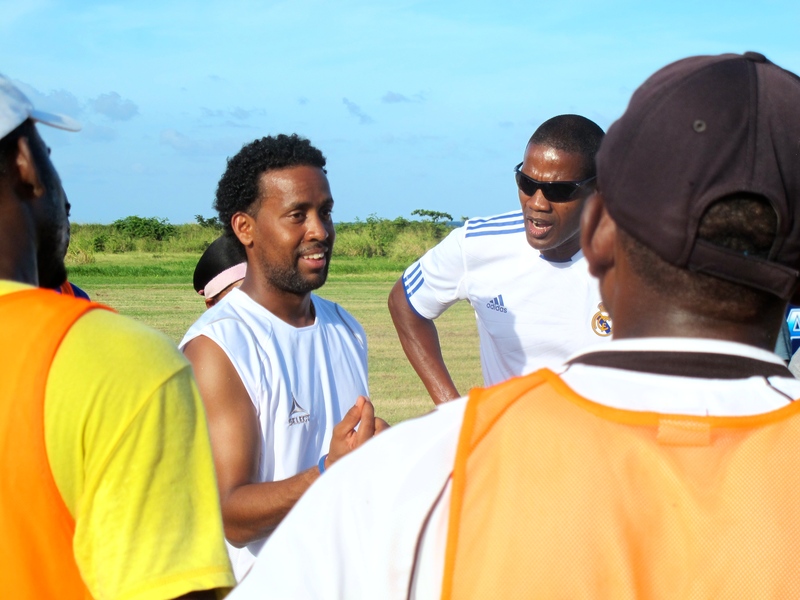 The leader of the Real Madrid Foundation is Aaron Lawrence, a former national-team goalkeeper who represented Jamaica in the 1998 world cup. Aaron participated in the coaching sessions and also doubled as our gracious chauffeur throughout our stay in Mo Bay. When we arrived to the training pitch the first day, we were blown away. The field was located right on the water, and luckily we had time to explore a little while awaiting the arrival of the local coaches. After we dipped our toes in the water, it was time to get down to work. We had sixteen coaches throughout the three-day training, which made for a very intimate but intensive course. The majority of coaches had never been introduced to the concept of football for social impact, so it was inspiring to see them buy into the CAC curriculum over such a short period of time. 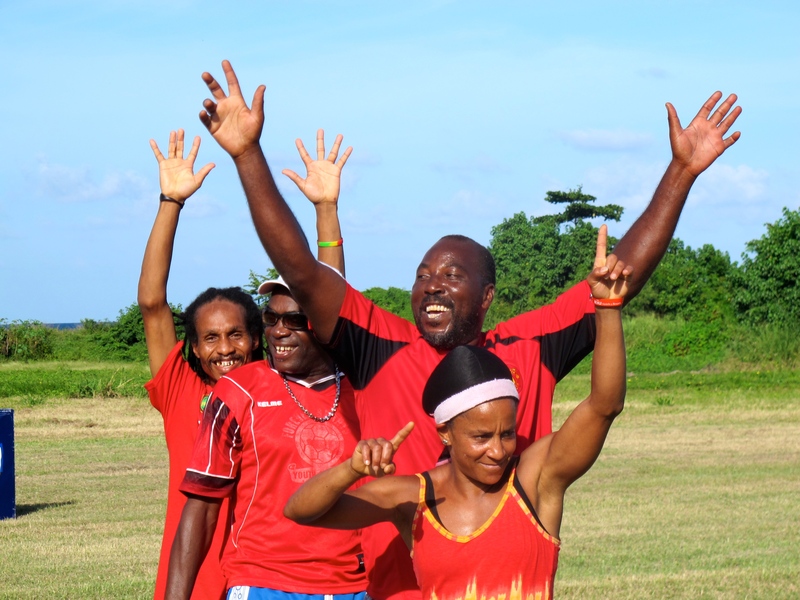 We were encouraged by the effort given by all the coaches, and were happy to see them teach back several of the games with their own Jamaican flavor. Some of the most interesting learning in Mo Bay (for the CAC coaches and the local coaches) came off the field, during discussions held over water breaks. 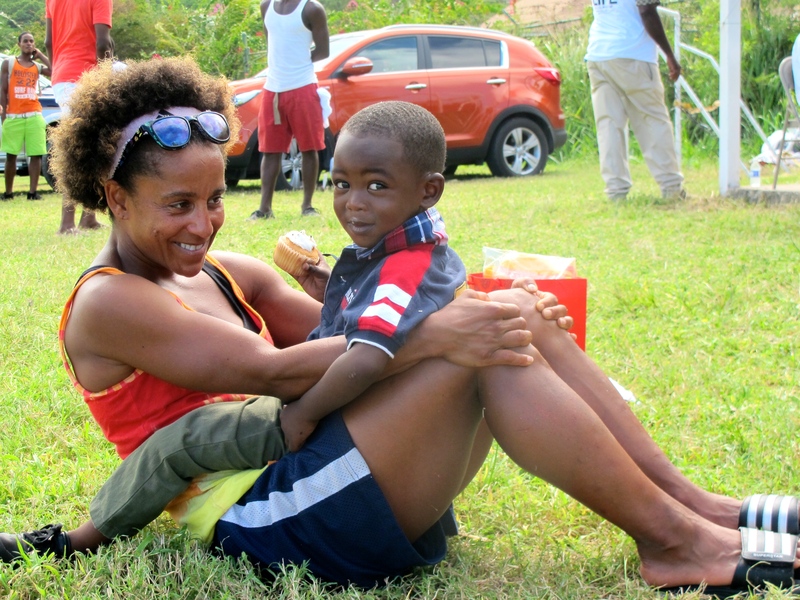 Major issues in Mo Bay, and all of Jamaica, include gender equity and HIV/sexual health. We had a frank discussion with the coaches about why girls should play sports and were intrigued by the nuances of gender relations in Jamaica as described by the coaches. They ultimately gave many thoughtful responses to the question we posed and overwhelmingly supported the inclusion of girls in sports. We also had an interesting discussion about HIV and sexual health during our day teaching Adebayor games for HIV education. We were delighted to hear the perspective of not only the coaches, but also of Juliet, a Real Madrid Foundation staff member and parent of two boys who participate in the organization. Juliet and the coaches animatedly discussed the unique roles of parents, coaches, and teachers in HIV education. We left the conversation with the understanding that HIV education can be taught in a variety of different venues and that great strides are being made to accommodate such multifaceted education in Jamaica. 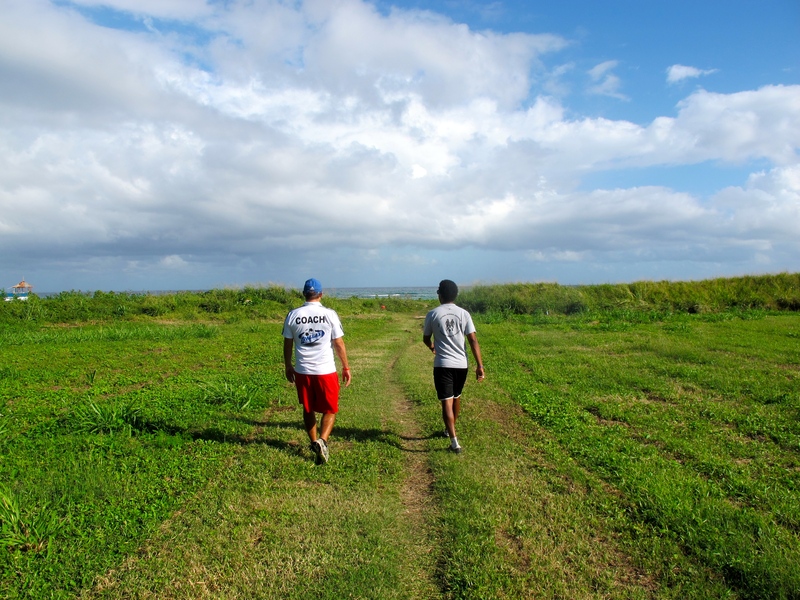 Overall, our time in Jamaica has been extremely rewarding. Though we have completed our first year here, we are excited to see what the future holds for our partner organizations. Everyone involved in the program is committed to incorporating football for social impact into their coaching curricula, and we expect the number of participating coaches will multiply over the next two years. 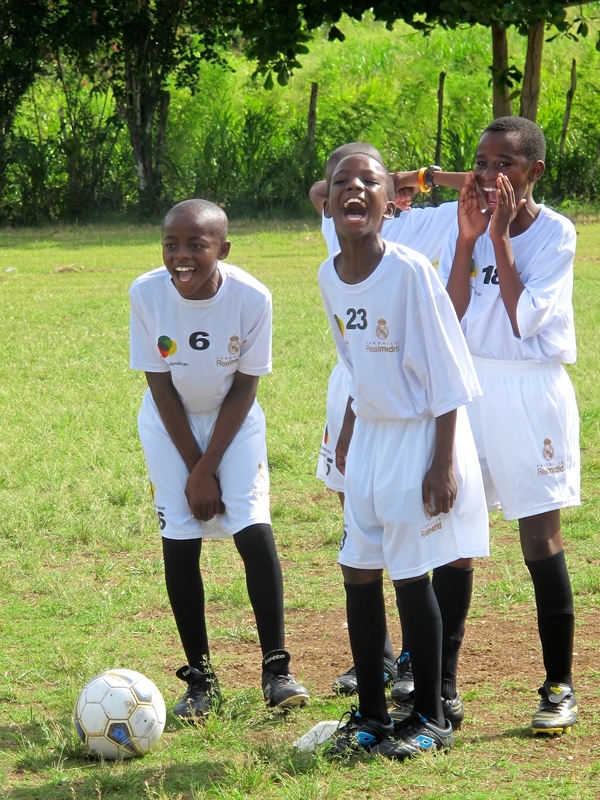 With the support of Ballaz International, the Real Madrid Foundation, and the Spanish-Jamaican Foundation, we truly believe that football can have a significant social impact in Jamaica. Previous: CAC in Portuguese Creole! Thanks a lot Your organization looks great!